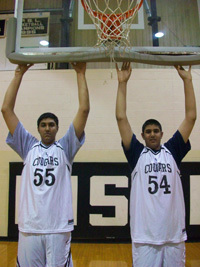 7 foot 5 inch Asian Canadian Sim Bhullar (pictured here on the left next to his brother Tanveer) has decided to put himself into the NBA draft after finishing his sophomore year at New Mexico State. Bhullar averaged averaged 10.4 points, 7.8 rebounds and 3.4 blocks in the 2013-2014 season. He has received some criticism for joining the draft (some saying that he needs to greatly improve his skills), but one writer points out that while he is unlikely to be selected, a big man’s career is short and that he should make money while he can, whether in the NBA’s Developmental League or outside of the US. His younger brother, 7 foot 3 inch Tanveer shown on the right, also played this past season for New Mexico State. The New Mexico State Aggies won the 2014 Western Athletic Tournament, with Sim Bhullar winning tournament MVP for the second straight year. The Aggies lost to San Diego State in the first round of the NCAA tournament. If Bhullar makes it into the NBA, he would be the first NBA player of Indian descent. In this Sprint commercial, an Asian American dad turns into a clone of 6’9” basketball player Kevin Durant. His wife isn’t at all displeased. Watch to the end to see what the mom wants from her huge, newly transformed husband. If you haven’t heard already from numerous sources, Jeremy Lin has officially taken the $25 million offer from Houston Rockets after his home team, the New York Knicks, refused to match the offer. If I was in his shoes, I would take that offer because I could certainly use the payroll upgrade. But then there is that question of loyalty and being grateful to the people that made you a standout in the first place. It’s pretty clear that this is not sitting well with a LOT of people. With rising incomes, media-savvy youth, and a huge population, India seems to the NBA to be it’s next big thing. One problem – Indians don’t seem to like basketball that much. “Genetically, we’re not inclined that way,” says an Indian sportswriter in an article in the LA Times on this subject. Sports are also seen as a distraction from studying. There is lack of sports facilities in most schools, let along basketball courts. Poor students with only one change of clothes are reluctant to get sweaty at school. Then again, poverty hasn’t stopped Filipinos from being basketball fanatics. I decided to watch the 2010 NBA Draft this year hoping to see Jeremy Lin getting drafted, especially by the L.A. Lakers. When the #43 and #58 had passed and Lin’s name wasn’t announced, I still had hope because I knew Lin still could still play in the NBA Las Vegas Summer League (and he got invited to play for the Mavs). After game 1, Jeremy Lin finished his first game with 12 points, 2 assists, 1 steal, and 1 block shot. I thought Jeremy had a good game and showed what I expected, which was fearlessly attacking the basket when he had the chance and trying to find the open teammate. He’s quicker than most people expect and plays aggressive defense. I do think he needs to show that he has a consistent jumpshot, but that can always be developed and improved upon. Jeremy’s performance even got some recognition on ESPN.